When photographic film with a cellulose acetate support begins to deteriorate we say it has vinegar syndrome because it forms acetic acid (among other deterioration byproducts) and smells like vinegar. The acetate support also shrinks and becomes brittle eventually pulling away from the gelatin image layer in patterns often called channeling. The plasticizer in the acetate support comes to the surface and forms small bubbles between the acetate support and the gelatin image layer. With all this deterioration and deformation it becomes impossible to print or scan the negative and get a good quality result. Cold storage is the only way to slow down this deterioration process, but it can’t reverse deterioration that has already occurred. So for some negatives it is necessary to separate the very thin gelatin image layer from the deteriorating support. This technique of “emulsion stripping” was first pioneered in Canada in the 1960s as a photomechanical layout technique for combining graphic elements in the creation of camera ready art for printing. 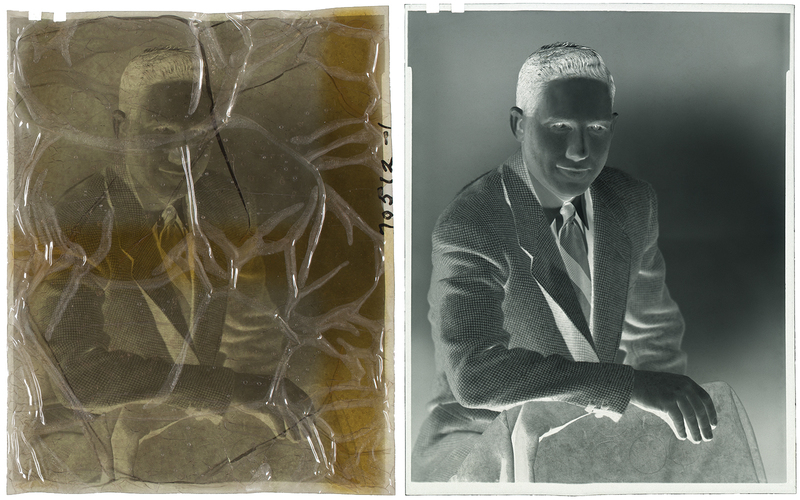 It was adopted in the United States also for graphic arts purposes in the 1970s and by the 1980s was being used for the first time as a conservation method for deteriorated acetate negatives. It turns out that even after all the dramatic deterioration of the acetate film base, the gelatin image layer is usually still OK, and can be separated, scanned, and then stored safely. The new digital image file can then be written back to a new sheet of polyester-base film or stored in a digital repository. Gawain Weaver Art Conservation has been performing this process for several years. Please contact us to discuss your project. The Bruker III-V+ handheld XRF is available for rental by the day, week, or month. Available accessories include a tripod and vacuum pump. We also provide analysis or instruction, on-site or at our studio.